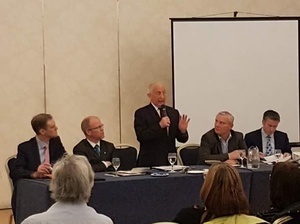 Last evening I attended a ‘Meath for Unity‘ debate in the Newgrange Hotel Navan chaired by Meath GAA legend Seán Boylan. 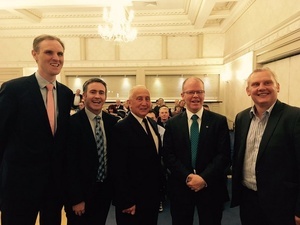 The debate on the issue of Irish unity was organised by Peadar Toibin TD with guest speakers Shane Cassells TD, Junior Minister Damien English and special guest John McCallister former Ulster Unionist Party Member of the Legislative Assembly. Sean kicked off proceedings with an account of his own personal experiences of north/south relations during his career. Shane followed with a historical context. Damien stressed the importance of consent beyond a 50% + 1 majority for unification. Peadar was excellent with facts, figures and the potential benefits for the Island as a whole should unification occur. John was brutally honest in his view that unification was a distant second for the unionist community behind the more pressing issue of Brexit. The debate was then thrown open to the floor. Questions about Ireland in the Commonwealth were raised and answered. 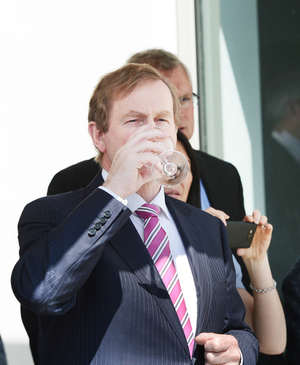 The need for more private business growth was stressed by Peadar. The question genuinely electrified the room. Most recognised my effort to look beyond our own insular view of the situation but a sizable group became immediately irate and accused me of ‘Ambushing the Minister’. It was not my intent to ambush Damien. For me it was the kind of nitty gritty question which would have massive ramifications if we are ever to reach a position where unification is a workable possibility. Much to the anger of the majority of those present, Damien avoided the question by saying that it was a good deal with which doctors agreed and that we should all read the agreement (I have). The palpable anger in the room at Damien’s non-answer does not bode well for Fine Gael. The issue of the National Maternity Hospital’s ownership is vital not only for women and their families, it has implications far beyond our current borders and is pivotal in how we in the south are perceived by our northern brethren. The anger at grassroots level as to how the ownership of the National Maternity Hospital has been handled by Fine Gael is a very bad omen for Fine Gael. I have no doubt that when it comes to election time, the ‘little free stater’ attitude they have displayed on this issue will come back to bite them in a very big way. The ownership of the National Maternity Hospital is not exclusively a south of Ireland issue, the world is watching, our neighbours are watching, Fine Gael has failed to realise that they are on a bigger stage, a possibility of unification stage. Posted in Misc and tagged Martin McMahon at 10:14 am on April 28, 2017 by Martin McMahon. Aren’t you great now for doing all that and coming back here to tell us all about it. And you even read the report. End to end. And they turned on you – and you only trying to do your best and all. Shocking so it is. I am also delighted that Martin is so delighted with himself. Ah, the beautiful sound of bitter, offended right wingers. Good work, Martin. +100 = well said Moyest. That really stuck in their craw I bet. Those people attending that meeting sound vile. and aren’t you the great little fellah, first on the comments with a snarky rebuttal. have another digestive for yourself there, you’ve earned it. Were you there milo or is this just your usual blueshirt (knee)jerkery? They don’t allow the shirt to reach down to their knees, they tuck them into their y-fronts. Yellow to the front, brown to the back, that’s how the gaelers know how to put on their shirts. It was hardly an ambush, nor is a awkward question. More like it proves that our political class find it impossible to give their own opinion when they put “party” loyalty above the citizenry. Its a ridiculous question that reflects complete ignorance of Northern Ireland. Unionist don’t crave a modern liberal republic. They still have significant abortion restrictions in NI and in parts of the Unionist heartland they lock playgrounds on Sunday out of respect for the Sabbath. Yes Joe, as much as I agree with Martins politics, this was not the arena for grandstanding. Cheap shots make for good tales, but will not help the cause of reconciliation. I actually think a united Ireland could be a more conservative country, based on the people I personally know from there. agreed. Down here, hateful and discriminatory behaviour is seen as embarrassing, not a basis for a political platform. Unionists mightn’t be keen on the idea of living in a country that hands over ownership of vital parts of national infrastructure to the Catholic Church, what with their Protestantism and Orangeness and all. Of course they will. They’re perfectly fine with the idea of an apartheid state based on religious differences. They’ll simply want their own similar Orange versions of SVHG. Ok. Northern Irish Orangemen will be fine joining a country that is part governed by the Catholic Church. Fascinating. Hysterical nonsense but fascinating. We have religious ethos schools. Do you think the Orangemen would be in favour of keeping that basic idea or of moving to a purely secular format? Same principle with other religiously-impacted elements of our public services. In a purely secular society the Orange order withers and dies, they need a continuing clash of “we have to protect our own” on both sides. Fascinating that you can’t comprehend this. OP; Chap makes point that our society’s state level relationship with the Catholic Church can convey the message that we’re not an open society for everyone. Me; I agree with him mentioning that unionists mightn’t be keen on a rejoining us given that relationship with the Catholic Church. You; They’ll love having apartheid, ask for their own system *and* see that system wither and die in a secular republic….even though the point here is that handing over state assets to the Catholic Church implies we’re not a secular republic. All over the place and that’s before getting into the rather surprising ignorance on the history of the region. I mean, the Catholic Church’s involvement in the state was the main reason NI came into existence in the first place but apparently it’s a reason to end its existence now. I’ll ask it again cos you went all Helen Keller the first time around. We have religious ethos schools. Do you think the Orangemen would be in favour of keeping that basic idea or of moving to a purely secular format? Now move that idea on to religious ethos hospitals. Same question. For a bonus doggy biscuit you can show me where I suggested we live in a purely secular society. Then you can go for your afternoon nap. Asks me a bafflingly stupid question. Gets hand held through reason for its irrelevance. Responds with same question. You’re a strange boy. How would they handle gay marriage? Again, I agree with you rotide. Our Northern “brethren” are even more conservative than the worst down here. Quite apart from all other considerations, I see no advantage whatever in introducing yet more religious tyranny into this benighted country. Yeah, but they’re not fond of the Pope, was the point of the question, no? It’s odd. I’d be fairly high on the aul liberal scale. For me… in an ideal world all services would be delivered on a secular basis. But I’m also someone who has seen the world and is not completely and utterly ignorant of the outside world. Which will make it very hard for Martin to actually comprehend what the outside world thinks. The Unionist community of Northern Ireland’s leading party is affiliated with a fundamentalist Presbyterian church which has more extreme views then the Catholic Church ever had. There is no abortion in Norn Ireland. Arguably the Unionist community in some ways would be more comfortable in Ireland because of the way we allow schools and hospitals be run on a sectarian basis rather than the secular structure of England and Wales. Not to mention many other countries (US, Germany) have high ratio of medical and educational facilities delivered by religious organisations. This alongside the ” the Government should have unlimited powers when it’s something I want (like taking the land off the Nuns for a pittance) but should not dare infringe my rights in other ways suggests that this is a la carte liberalism at it’s best. 1. Put in an agreement that leaves property in ownership of Nuns but puts in arms length governance model to assure independent medical ethos. Get the best location attached directly to a modern university hospital. 2. Pay 20/30m CPO for a landlocked site and all the legal complications of getting access etc. and get nothing more than making Martin feel happier about how Ireland “projects” itself. * Or build it on a golf course costing and even more money and building “tunnels” according to Peter Boylan. 3. Plant the place off site in RTE so instead of rolling someone down a corridor you have ambulances running up and down the speed bump laden Nutley lane. If we want to have a constitutional referendum of ownership of the hospitals/schools lets do that but less of the insincere “Fine Gael” did it for laughs and there is an easy alternative solution (aside from the fact pretty much every other party would have done the exact same). The legend that is Seán Boylan, who decreed to his players, including Colm O’Rourke – a shoot-to-kill policy (on-field, that is) against players from the North – particularly, Tyrone – participating in a “What If?” scenario, come “Ultimate Unification” would have had a certain appeal to me. The “ambush” was surely just a question that everyone in the room must have had. I’m reminded of the most recent post in, “Waterford Whispers News”, where a “spokesnun” from the new maternity hospital stated that they’d welcome everyone, provided they were married. There were insinuations to a pit, which the “spokesnun” refused to comment on. I guessed if there were a GAA reference, you’d be there, Frilly. The “Royal County”, what with, notwithstanding it being the “Seat of The King of Ireland” – except, it really wasn’t! The true king was a guy from Tyrone, O’Neill, was his name. His job? Massive procreation to the point where everyone in Tyrone is called, O’Neill (myself included). The Tara Heads know this, and act (again, on the field) according to the code of “The Boylan” when Meath face up against Tyrone. 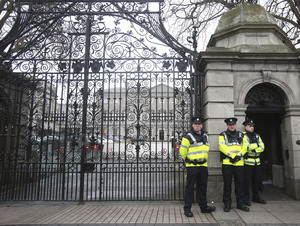 Did you ask them how the marriage referendum would affect reunification? Seeing as the politicians there have consistantly voted against it and that was something that the world was ACTUALLY watching when we voted in favor of it. Your question, while hardly an ambush, had nothing to do with the debate at hand. @rotide – That’s kinda what I mentioned earlier, hoped that others would pick up. The debate was, “Ultimate Unification”. It was a “thing” agreed – “The agreement was signed in London on 6 December 1921, by representatives of the British government (which included Prime Minister David Lloyd George, who was head of the British delegates) and by representatives of the Irish Republic including Michael Collins and Arthur Griffith. The Irish representatives had plenipotentiary status (negotiators empowered to sign a treaty without reference back to their superiors) acting on behalf of the Irish Republic, though the British government declined to recognise that status.” Straight out of Wikipedia – but it goes on to say that the 6 counties, if the majority, becomes Catholic/Republican, then there’ll be unification. did women of Meath care to speak on the topic? oh yeah, the SF ladies, of course. 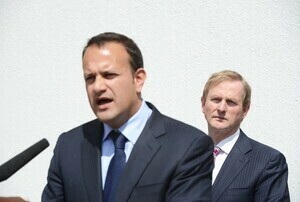 Fine Gael are ‘little free staters’, the bigger picture escapes them. Time to go, time for some proper ‘world stage’ politics. Why don’t all who hate Ireland just move up north? It would suit your pursed little lips and you would learn what proper bigotry looks like. I hear you Milo. I’ve lived in Belfast for the past couple of years – bigotry is plentiful up here! i am going to bunjee jump off the harland & wolfe crane this weekend. 50%+1 is plenty for unification. The artificial statelet should never have been created. If the nutty unionists don’t like joining the rest of Ireland, they can go back to the ‘mainland’. They can see how great their empire has crumbled. My view on the hospital is that the Government cannot give 300M Euro worth of property away to anyone. It is not theirs to give away. – that €300m is going to seem like peanuts compared to the £13bn we will have to pay each year to keep the North afloat post-unification. Did you see that Canadian study, that said unification would be worth 8 Billion Euro to Ireland? The British caused the problem, so they will contribute for 20-30 years after unification. You know how much they will want their loyal subjects to be looked after. Our European friends will help, too. A united Ireland will be function a lot better, on so many levels. You will be doing the work of the Empire if you think partition is the best long term outcome. You and the extreme loyalists on the same side, nice. I attended this conference and was very disappointed. The title was misleading. I had assumed the Meath For Unity was a gathering for reunification with Westmeath. The Fifth Province will rise again my friends. That’s what I thought – it turns out…this! I don’t want a united Ireland. Will we get a vote down here? Isn’t an all-ireland poll part of the GFA? what were Sean Boylan’s thoughts on the medical care of pregnant women? can you cure a fatal foetal abnormality with a rub of a dock leaf? Yup and some morning dew, gathered in the month of May. Never fails, I tells yah. To be fair, Seán Boylan cured lots of Tyrone types of thinking there’s a fourth All-Ireland in them, under Mickey Harte. Kerry is the key to how football should be played. Long high ball into the square – couple of lanky Kerry marauders punch into the net. Simples! An electrified room in Meath, there’s fancy. One should never allow real life issues to intrude when professional waffles are happily waffling. As for gifting 300 millions to a private company, compared to what these gombeens have already done, that’s only small change to them. The salient point – constantly glossed over by discussion of clinical independence (upon which I would insist) – ownership of the expensive, tax payer funded Hospital. In what situation would it be proper for me to offer you a building site, on condition that I would own whatever was built on it? 244 Private en suite rooms on the plans. Imagine the profit!! I think it’s okay to call one’s self a Republican these days – previously, there’d be a certain perceived attachment to The IRA. The polling last time in the North was kinda 50/50 – there’ll be another soon, when Arlene Foster’s apologies to Na Gaeilgeoirí won’t wash. Líofa cost 50 grand a year to finance – the renewable heat incentive scheme cost a half a billion (She was Finance Minister at the time) and it was clearly corrupt.